Average Adult Fish Size: 15 feet / 450 cm!! Recommended Minimum Aquarium Capacity: 40 gallons / 560 litre initially, but in very short order they require a pond or huge aquarium (10,000 gallon / 40,000 litre) of adequate size. 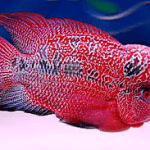 Compatibility: Relatively peaceful given their eventual huge size, but they are best kept with other fish that are too large or quick to be eaten. Feeding: Will eat live fish, but this is not the best diet for an Arapaima. 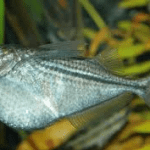 Most smaller Arapaimas will readily eat pellets, sticks, chunked frozen food, chunked raw fish and fillets, market shrimp, and shelled mussels. Large adults do best on a diet of extra large pellets and thawed whole fish and squid. Sexing: Females tend to be shorter, but more round. Males are also predominantly more colorful. 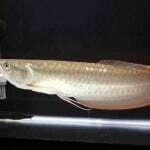 Breeding: The Arapaima is an egg-laying mouth-brooding species that tend to its eggs as well as its larvae. 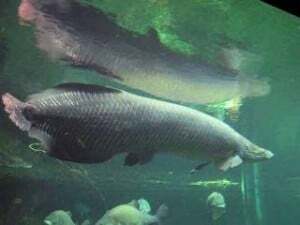 Since Arapaima fish sometimes inhabit oxygen depleted waters, they will aerate the water to make sure that the eggs get enough oxygen. Adult fish can communicate with their offspring by exuding a special pheromone from the head. 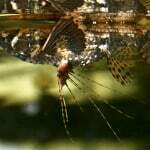 The pheromone makes the larvae stay close to their parents where they can be protected from predators. 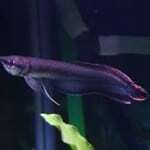 The reproductive cycle of Arapaima fish depend on the seasons, and the female will lay eggs in February, March or April. During this period, the water levels in the Amazon River Basin are very low. The eggs are placed in a nest that has been built by the parents at the bottom. This nest is usually around 50 centimeters in diameter and 15 centimeters deep. When the eggs hatch, the flooding season is well on its way in the Amazon River Basin and the offspring can feast on an abundance of small aquatic organisms. 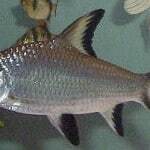 Additional Information: Arapaimas are one of the largest freshwater fish in the world. Juveniles can initially be kept in a large aquarium, but only a large pond will suffice for even a moderately sized adult. Arapaimas gulp air, so if they are kept in an aquarium be sure and leave enough air space between the lid and the waters surface. The lid should be thick and/or be made tempered glass with no gaps. The head of an Arapaima should be respected as it is is solid bone and can break a glass top, or even an aquarium, that is not strong enough. They are becoming increasingly rare in the wild as they are considered a good eating food fish. 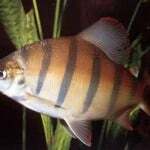 They are even commercially raised in S. America as a food fish. 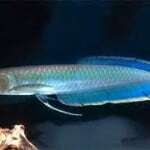 This entry was posted in Profiles Tropical All Fish, Profiles Tropical Arowana, Profiles Tropical Oddballs.